In the summer of 1958 Edward Plunket Taylor was at the Saratoga yearling sales with a fresh load of cash to spend. Taylor’s well bred dark bay four year old horse Nearctic had just won the Michigan Mile. Thus he was in the mood to spend some money. Taylor was always looking for good broodmare prospects at the big yearling sales and spotted a lovely bay daughter sired by the great champion Native Dancer. The filly was out of stakes producing mare Almahmoud, who was by Mahmoud. He was able to buy her for $35,000. Taylor’s wife Winnie named the filly Natalma. Natalma was sent to Horatio Luro for training. She raced in the turquoise and gold silks of Windfields Farm racing stable. Natalma showed a lot of promise as a two year old but developed a complete dislike for the whip, eventually refusing to go on the track for training work. Luro was very patient with the filly, requiring considerable time before Natalma would finally trust her riders that they would not use the dreaded stick on her. She was pointed to the filly classics after missing the big two year old races due to her fear. Natalma was by all accounts training superbly but unfortunately she came up lame a week before the Kentucky Oaks due to a calcium deposit from a bone chip was found on her right front knee. Windfields’ management now had a dilemma on their hands. Their choices were for her to have surgery to repair the injury, which would allow her to recover and race for four year old campaign or retire her from the track to be bred, even though it was now quite late in the breeding season. Originally, Natalma was purchased as a broodmare prospect so Taylor decided on the latter choice and breed her to his new stallion, Nearctic. Taylor figured that if she did not catch on the first mating then she might just go back to the track. Natalma was certified in foal to Nearctic from the first mating and on May 27, 1961, she produced a little bay colt. Mrs. Taylor would come to name the young son of Natalma, Northern Dancer. From the beginning of his life, Northern Dancer would display a feisty dominant attitude. He would always be the lead colt in the paddock frolics with other colts on the farm. His fellow colts were growing taller than him but this did not deter his obvious self confidence and an almost stallion like control of the herd. Even as a yearling the farm staff would note his strong will and determination as he developed. Northern Dancer was offered at Windfields annual yearling sales for $25,000 but there were no takers. Apparently put off by his lack of height, the friends and fellow horsemen Taylor would invite, deemed the little Nearctic – Natalma colt as being no more than a pony. As was the custom of the Windfields sales, once half of the yearlings were sold the remainder would stay to train and race in Windfields colours. Northern Dancer was sent to Horatio Luro’s Woodbine division for training to become a racing colt. He was not one of the exercise riders’ favourite mounts. His strong will, inherited from his sire (Nearctic) and grand sire (Nearco), would cause a few humans to get tossed and end up on the ground. No one was seriously hurt and Northern Dancer never attacked anyone but he was stubborn and his instincts would cause him to reluctantly accept a rider on his back. After he grudgingly partnered with a rider during his morning workouts he showed great bursts of speed. Luro had suggested to Taylor that he felt Northern Dancer should be gelded, to calm him. Taylor refused to do so. It is very interesting to look back at moments in time that change the course of history. I am sure no one during the birth, watching his growth and development, or witnessing the dismissal of his potential, and the reluctance to geld Northern Dancer as being defining moments in time. But these ever told and highlighted moments of Northern Dancer’s young life would become legendary paradigm shifts that were destined to change the destiny of Thoroughbred breeding. Ron Turcotte became the first jockey to steer him in a race. Turcotte was a strong tough French speaking Canadian from New Brunswick, with a solid back ground in horsemanship. He got his start in Thoroughbred riding at Windfields, breaking yearlings for Windfields Canadian based trainer Pete McCann. Turcotte went on to become a Hall of Fame Jockey in a very distinguished career, which was highlighted by his partnership with the great Secretariat. Still an apprentice, Turcotte had the mount for Northern Dancer’s first maiden two year old race at Fort Erie Racetrack. The Dancer won the five and one half furlong race by six and one half lengths in 1:06 1/5, a fifth off the track record. Northern Dancer’s two year old year was very successful. He went on to win the Summer Stakes, the Carlton Stakes, the Coronation Futurity and then the Remsen Stakes at Aqueduct. During this time, he had shown to be very adaptable to rating his speed, and therefore able to conserve has energy for longer distances. He was voted champion two year old in Canada and a colt to be considered a contender for the upcoming three year old classics in the US. He won seven of nine starts but was also plagued with nagging injuries including a quarter crack on his left front foot towards the end of his two year old campaign. A new treatment for his condition was used to help in accelerating the healing process. With the old tried and true method for healing quarter cracks, the hoof would be allowed to grow out which would take a considerable amount of time and a loss of valuable training. Luro had learned of the new treatment designed by blacksmith Bill Bane, and called him in California. Bane came to Belmont where Luro kept his charges and applied a vulcanized rubber treatment to the cracked hoof. This material would allow for the hoof to grow but also keep the crack from becoming worse by allowing the hoof to flex normally during regular activity. Northern Dancer would exhibit his considerable intelligence to allow the treatment to be administered and then adapt to the odd feeling in his left foreleg while the healing process took place. Luro then took Northern Dancer and the rest of his stable to Georgia for some rest and to get ready for the upcoming season. Northern Dancer’s foot was healing better than expected and Taylor began to get excited again about winning the Kentucky Derby. Luro put Northern Dancer back into training two weeks later at Hialeah Park and plan his program to get The Dancer to the Derby on the first Saturday in May. Long slow gallops were the orders for Northern Dancer’s training while the foot healed but Luro knew that the colt needed a tightening race for his fitness, so he was entered in an allowance race of six furlongs. Bobby Ussery was engaged to ride with the instructions to rate Northern Dancer to give him the mind set for the longer races to come. However Ussery found himself at the back of the pack after he and Northern Dancer were blocked off at the start, which prompted Ussery to wail on Northern Dancer with his whip. Luro’s Latin temper boiled and he lambasted Ussery right after the race. Bill Shoemaker was brought in for Northern Dancer’s next race, a three horse exhibition against the good horses Chieftain and Trader. Northern Dancer won by seven lengths, impressing Shoemaker. He took the reins for the Flamingo Stakes, winning by two lengths with two other Derby hopefuls Mr. Brick and Quadrangle well behind him. Shoemaker was not totally convinced that Northern Dancer could get the one and one-quarter mile Derby distance as he felt the colt lugging in during the stretch run. The Shoe was also engaged on Hill Rise, a big impressive colt from California, and it is this colt he would later partner in the Derby. The lugging problem was likely due to either the patched hoof or a splint problem Northern Dancer had developed. Previously, Luro had not been too concerned over as his prized trainee had the problem for most of his young racing career. The Shoe rode Northern Dancer to victory in the Florida Derby but it was at the victory dinner that evening, when he announced his intention to ride Hill Rise in the Derby. As a result, Bill Hartack became the jockey for Northern Dancer. Hartack had been aboard Decidedly to win the 1962 Kentucky Derby, a horse trained by Luro, so these two were well aware of what to expect from each other. The first race for the new horse/jockey partnership was the Blue Grass Stakes at Keeneland Racetrack. Northern Dancer and his new partner Bill Hartack won by only half a length, prompting some of the turf writers to summarily dismiss this little horse as a major contender to the bigger Hill Rise. However, other writers had faith in Northern Dancer and dubbed him the “Pocket Hercules”. He may have been short but was quite stocky and filling out beautifully. Being only 15.1 hands in height, he possessed a seventy-three inch girth. Compared to most 16.0 hand colts which had seventy-two inches around the girth, he appeared stocky but powerful. Coupled with his dominant will, Northern Dancer was a powerful force in a small package. The Kentucky Derby is one of the most cherished prizes in Thoroughbred racing in America. No Canadian bred had ever won before. Four years prior to entering The Dancer, E.P. Taylor entered Victoria Park, in the classic race. Victoria Park was a good honest race horse. He was bred from bloodlines Taylor had developed through many years, but was just a slight cut below the top horses he faced in the USA. Victoria Park would finish third in the 1960 Derby and then second in the Preakness two weeks later. These close finishes gave Taylor continued hope to achieve his goal of winning the Kentucky Derby. On May 2, 1964, Bill Hartack guided Northern Dancer, who was not fully three years old yet, to victory in the Kentucky Derby from the hard charging Hill Rise, and his rider Shoemaker. The time of two minutes flat set a new track record and also set off an explosion of celebration in his home country. He became Canada’s horse. The image of his courageous stretch run, holding off his larger opponent, was beamed right across Canada on TV. The Dancer’s short choppy stride against the long smooth stride of his challenger was a beautiful sight for every Canadian at Churchill Downs and those watching in their homes. Hill Rise got to Northern Dancer’s neck but no closer as you could literally see the will and determination of the “Pocket Hercules” deny anyone but himself of the glory of winning. The out pour of jubilation was infectious. People from all over Canada boasted and bragged about our horse. The legend of Northern Dancer, while beginning to grow before the race, was now in full bloom. Two weeks later, he won the Preakness Stakes in a much more convincing manner. He was denied the Triple Crown when he was defeated in the Belmont Stakes, finishing third to Quadrangle and Roman Brother. However in Canada, that didn’t take the lustre away from The Dancer winning the Kentucky Derby. E.P. Taylor had done it. He bred and raised a Derby winner right in Canada, as he said he would. Taylor was always a proud Canadian and he was thrilled with the love and affection shown to Northern Dancer by his fellow Canadians. One more big prize was waiting for Northern Dancer to capture. The Queen’s Plate was and will always be the major race for three year olds in Canada. Taylor had made a habit of winning this race for the past two decades. He was even booed by the patrons at Woodbine the year before as he accepted yet another Queen’s Plate trophy when Canebora won the 1963 edition. There would be no booing this year though as Northern Dancer won as expected by seven lengths to the wild cheers of his adoring public. Northern Dancer seemed to relish the adulation as well, prancing around as he came back to the winner’s enclosure as the crowd gave him and the Taylors a standing ovation. Although the Queen’s Plate would be his last race, this was not the original intention. While in training for the upcoming American Derby at Arlington Park in Chicago, Dancer developed a bowed tendon in his left foreleg. Despite treatment, the inevitable decision was made to retire the champion from training. At this point in his career, he had become a valuable stallion prospect and also a favourite son in the Windfields family. October 24, 1964 was Northern Dancer’s last appearance on the track as E.P. Taylor organized a celebratory farewell at Woodbine in order for The Dancer’s adoring fans to say goodbye. The appearance was just before the Canadian International was to be run and Ron Turcotte was given the honour to ride Northern Dancer. In an interview several years later, Turcotte reminisced about Northern Dancer, and one could see he was visibly moved by the honour of riding the Canadian hero when recalling that day when the Taylors asked him to ride Northern Dancer for his final public appearance. Northern Dancer was named the top three year old in the US and Canadian Horse of the Year, a bona fide Canadian icon. He was even awarded the Canadian male athlete of the year award over some of the country’s finest human athletes. This was unprecedented and no other non human has ever been so awarded. Now Northern Dancer would begin the next chapter of his incredible legacy and essentially conquer the world as one of, if not the most influential sire in Thoroughbred history. Windfields National Stud farm in Oshawa Ontario became his home, alongside his sire Nearctic, Victoria Park, New Providence and other champions bred or purchased by E.P. Taylor. The farm in Oshawa was the pre-eminent stud farm in Canada, which Taylor had purchased from Canadian auto pioneer Col. R.S. “Sam” McLaughlin. Colonel “Sam” in his day was one of the top breeders and owners of Canadian Thoroughbreds. The property was called Parkwood under the Colonel’s ownership and was the birthplace of some of the finest Thoroughbreds in Canada, which includes McLaughlin’s great champion Horometer. Under the Taylor family’s ownership, the tradition was to become legendary and achieve world class status. It should be noted here that E.P. Taylor was very keen to have Northern Dancer stand at stud in Canada to make him available to Canadian breeders. His patriotism and desire to help other fellow breeders in his home land improve the quality of Thoroughbred bloodlines in Canada was a big reason for him to turn down many lucrative offers to syndicate Northern Dancer to one of the many fine breeding farms in the US. He placed a stud fee of $10,000 on Northern Dancer, which was happily paid by the breeders lucky enough to acquire a season to the young stallion. Furthermore, Taylor sent many of his best broodmares and broodmare prospects to Northern Dancer to support his new young sire. Right from the start, Northern Dancer exhibited a very healthy and energetic libido, taking to his new career with gusto and panache. His first tryst however would not be a good experience. He was to cover Taylor’s champion mare Flaming Page, who was a good full hand taller. Northern Dancer could not reach Flaming Page who was becoming impatient and kicked Northern Dancer squarely in the ribs. This would have made any other young stallion shy with apprehension, but not the determined Northern Dancer. A special pit was dug in the breeding arena to place the tall mare into, in order for Northern Dancer to make his cover. Once it was determined that The Dancer was not seriously hurt by the kick from his intended mate, Flaming Page was located in “Northern Dancer’s Passion Pit” and he performed his duty with the zest and enthusiasm with which he would exhibit throughout his career as a sire. Unfortunately the mating was not a success as Flaming Page would slip twins. Nonetheless, these two would meet again the following breeding season and the result was a colt of exceptional quality and class. Their son’s name was Nijinsky, the winner of the 1970 British Triple Crown. He was named as the horse of the year in Europe. Northern Dancer is the dominant influence in worldwide Thoroughbred breeding. It is estimated that seventy-five to eighty percent of all foals bred today have his name somewhere in their pedigrees, and the percentage is increasing. There are many champions that have two or more crosses of Northern Dancer, showing that in-breeding to the great sire achieves tremendous results. Dancer was the first superstar sire in the elite yearling sales auctions, passing the mantle to his sons and heirs. The highest price to ever be paid for a yearling was $13.2 million for a son of Nijinsky out of My Charmer, thus making the colt a half brother to Seattle Slew and a three-quarter brother to Lomond. Named Seattle Dancer, he won a pair of G2 races in Ireland and then sired thirty-seven stakes winners at stud. In fact, nine of the top ten priced yearlings in history are from the Northern Dancer sire line, including one by Danzig, two each by Nijinsky and Storm Cat and three by the patriarch himself. The one and only sire to crack the top ten was Kingmambo, a son of the great mare Miesque by Nureyev, by Northern Dancer. Northern Dancer’s pervasive influence has vaulted him to the top of the most important and successful sire lines in the world today. Through his sons and daughters, grand children and great grand children, the name of Northern Dancer is seen at least once if not more times in the pedigrees of many of the champion runners in the world today. 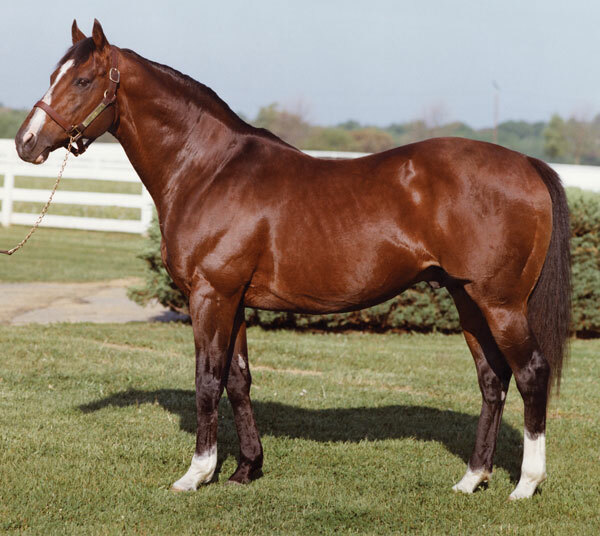 Northern Dancer sired thirty-two champions winning over one hundred championships in racing and breeding combined. Sons such as Nijinsky, Vice Regent, Danzig, Sadler’s Wells, The Minstrel, El Gran Senor, Secreto, Storm Bird, Dixieland Band, Nureyev, Be My Guest, Northern Taste, Lyphard, Fairy King, Lomond, Shareef Dancer, Try My Best, Night Shift and Ajdal all became champions on the track, in breeding or both. These sons have bred on with champion sons and daughters in both racing and breeding. Grandsons such as Galileo, Danehill, Deputy Minister, Storm Cat, Green Desert, Manila, Dancing Brave, Royal Academy, Lammtarra, Ferdinand, Golden Fleece, Shahrastani, Shadeed, Alzao, Regal Classic, Sky Classic, Niniski, Anabaa, Palace Music Encosta de Lago El Prado, Montjeu, Dixie Union, Chief’s Crown and more, have continued the excellence of the tail male line as either champions on the track, in breeding or both. The daughters of Northern Dancer also contributed mightily to the legacy of “The Little Big Horse” from Canada. Fanfreluche, Northernette, Royal Statute, Dance Number, Alma North, Laurie’s Dancer, Cool Mood, Danseur Fabuleux, Northern Sea, Wild Applause, Victorian Heiress, Falafel, and Northern Willow were ether high class stakes winners, produced high class stakes winners or both. Northern Dancer’s daughters as broodmares are responsible for the likes of L’Enjoleur, La Voyageuse, Halory, Passing Mood, Arazi, Eillo, Norcliffe, Grand Luxe, A Phenomenon, Southern Halo, Nedawi, Rhythm, Noverre, Medaille d’Or, Oil Fable, Scoot, Ravinella, Awaasif, Akureyri, Konafa, Northern Blossom, and Roar to name a few. Northern Dancer’s sons have also sired daughters such as Dance Smartly, Three Troikas, Minstrella, Miesque, Royal Heroine, Inish Glora, Balanchine, Toussaud, Bemissed, State, Bessarabian, Ruling Angel, Dancing Maid, Ruby Slippers, Sonic Lady, Reams of Verse, Salsabil, Moonshell, Ebadiyla, Imagine, Egyptband, Dispute, Versailles Treaty, Twice The Vice, and Banker’s Lady that became major stakes winners on the track or as major stakes producers or both. Many of the recent champions descending from Northern Dancer include Frankel, Cigar, Medaglia d’Oro, Lomitas, Kitten’s Joy, Giant’s Causeway, Awesome Again, Ghostzapper, Rachel Alexandra, Wise Dan, Sea The Stars, Makybe Diva, Black Caviar, Big Brown, Goldikova, Treve, Ouija Board, and Hurricane Run are all direct tail male through three or four generations. Many of these are inbred to the great sire. The lists above, while extensive, are only highlights of the enormous contribution Northern Dancer has made on the breed. In 1968, Northern Dancer was relocated to the new Windfields Maryland Division which E.P.Taylor established. The move was to give the emerging young stallion better geographical access to the many high class broodmares located within a relatively short van ride in distance. Many of these mares were from the top breeding establishments in Kentucky, Maryland and other surrounding areas. Taylor and many of the top breeders in Canada also sent many of the top broodmares from Northern Dancer’s homeland. As years progressed, Northern Dancer’s stud fee climbed rapidly from the original $10,000 fee when he began his stud career, due to the constant success of his get around the world. The final listing for a service to Northern Dancer would be listed as private. There are many reports that services were sold for $1,000,000 with no guarantee of a live foal! In 1981 an offer to buy Northern Dancer was received by Windfields’ management. The communiqué came from Dr. Laslo Urban, who was acting on behalf of a syndicate of European breeders wanting to buy Northern Dancer outright and stand him in France. The offer was $40 million. The syndicate headed by Windfields who owned the stallion turned down the astronomical offer. Such was the high esteem breeders looked upon Northern Dancer who were willing to gamble vast sums to acquire a twenty year old stallion! Such was the high esteem of the breeders who did have a stake in him! Northern Dancer’s legacy of excellence has been undiminished to this day. More than fifty years since he was foaled in Oshawa Ontario his name is spoken with admiration and affection by Thoroughbred enthusiasts. There have been countless books, magazine articles and on-line blogs highlighting and singing the praises of his record as a sire of champions and a sire of sires. Exquisite artwork by the most renowned equine artists have been issued on prints and collectables, depicting his conformation and his head with the distinctive angled white blaze, fetching top dollar in auctions and stores. His importance and popularity seemingly growing as the years move on. I consider him to be the greatest sire to ever have lived. My opinion is perhaps biased from patriotism and a genuine affection for what he has meant to Canadian Thoroughbred breeding, but I am not alone with this opinion. The facts speak for themselves. He sired over 23% stakes winners from all born foals, a total of one hundred and forty-seven in an era when stud farms were not booking over one hundred mares per stallion a season. He covered thirty-five to forty broodmares a year, at the most. He is also the broodmare sire of two hundred and two stakes winners. Northern Dancer’s sons and daughters won the most prestigious races against the best horses of their generation. He led sire lists in England, Ireland, France and North America several times and his sire line has expanded through the leading sires his sons and grandsons and great grandsons have sired. Northern Dancer was pensioned from stud duty in April of 1987. His once voracious libido had been decreasing for the past few years, as was his sperm count. He was no longer trying to climb the door to his stall to get to the mares in season he could sense. Northern Dancer, during his prime, would display complete resentment when he saw another stallion being led to breed, and would snort and rage with the thought that it was not he going to the breeding shed. With his enthusiasm waning and his pre-potency on the decline, Charles Taylor, who had succeeded his father as head of Windfields following a debilitating stroke in 1980, gave the order to retire the great sire. His remaining time was spent leisurely in his paddock, visited by many admirers and fans. His right knee became arthritic, he had grey hair about his temple and muzzle, and his back had swayed more with age. Yet, Northern Dancer was content and still the main man of the farm. In November of 1990, at the age of twenty-nine, Northern Dancer suddenly developed an acute case of colic. Charles Taylor ordered immediate treatment for the beloved aged stallion, and Dancer seemed to respond positively. However, by the next morning the colic had worsened. Due to his advanced age, surgery was not a viable option. Taylor and his staff then had to brace themselves for the inevitable. Northern Dancer was in immense pain, and with a heavy heart the order was given to cease his suffering. He passed away at 6:15 am on November 16, 1990. His body was brought back to Windfields in Oshawa where he was laid to rest. Northern Dancer meant so much to Windfields, the Canadian people and turf enthusiasts worldwide. His passing was mourned by all. Northern Dancer has taken his place as one of the most influential sires in the three hundred and fifty year history of recorded Thoroughbred breeding. His epic stud career has touched every jurisdiction around the world. He is still the head of the most dynastic sire lines in breeding today. Thank you E. P. Taylor for breeding and raising the most important Thoroughbred of the twentieth century, and ignoring your trainer’s request to geld him. Fantastic article. Northern Dancer was and still is a Champion. He is the great grandfather of my OTTB,Bet the Cat. Great article! Northern Dancer is the best stallion ever. What a legacy!!!! The best ever. Your article brings him to life. Such a remarkable horse. Thank you so much for your writing. I am so happy to find this wonderful site. No other horse compares to Northern Dancer. A little chunk of dynamite. His line just keeps going from strength to strength. I have seen more than five crosses of ND in some big stakes winners of late. I have also read many very good articles about ND but this one is by far the best I have read. Thanks for all the research you have done and put into a very enjoyable read. Great writing. We have much to thank Northern Dancer for. I have bred a few that became good runners and I always look for Northern Dancer in the stallions I choose for my mares. I had a mare by Regal Classic who gave me some nice foals when I doubled up with stallions that had Dancer three or four gens back. Coincidence I think not. Hard to under estimate Northen Dancer’s importance. So many greats he sired and so many alond his sire line. I think he does not get enough credit for his broodmare daughters. He may have been small but he is the giant of the breed. if you trace back all the past 20 years winner …. they all are related to northern dancer from the sire side or the dam …. what a champ…. What a lovely story of Northern Dancer. My parents took us to see him when he was at stud at Windfields—-such a beautiful horse he was! New to this site & glad I found it. A bit jealous Colin that you spent all that time at Windfields, love reading about all of them. The Plate is coming up in 2 weeks and anything you want to add about the entrants- Telekinesis (Ghostzapper) Silent Sting (Silent Name) & Wonder Gadot (Medaglio D’ Oro) etc, would be very appreciated. Wish Flameaway were in as well. See you at the rail shouting our heads off.